Ginesis Nutrient Conditioner is a thicker, more concentrated conditioner that contains natural healing oils, vitamin extracts (i.e. carrot oil) and herbs that help heal the skin and scalp. AVAILABILITY: Ships out within 2 - 3 business days. Our Ginesis Natural Nutrient Conditioner has been formulated with natural healing oils, vitamin extracts and herbs to rejuvenate hair and improve hair structure. The Nutrient Conditioner is a thicker, more concentrated conditioner to promote the healing properties of natural circulation impaired by harsh chemicals found in most conditioners. The unique organic formula will remove deposits from hair and scalp for a silky shine. The gentle conditioner also acts as a scalp lotion to treat those with scalp conditions such as extreme dryness, flaking, dandruff, seborrhea dermatitis and unmanageable hair. This particular conditioner can also be used as a hand and body moisturizer and for shaving face and legs. We offer 8 oz, 16 oz, 32 oz and 128 sizes. Those who have damaged hair and scalp from chemicals found in common conditioners and would like a thicker, more concentrated conditioner that safely rejuvenates naturally. 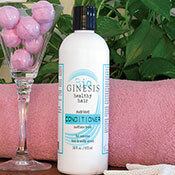 Is sensitive to chemicals and needs a conditioner with ingredients that are non-irritating. After shampooing with our Ginesis All Natural Shampoo, work a generous amount of this Nutrient Conditioner into hair and scalp and rinse with lukewarm water and towel dry.